Third-year pharmacy major students gathered in Reid Chapel earlier this month to help mark a transition to the next step in their careers. The Professional Pinning Ceremony was held on April 5, and Reid Chapel was full of students, faculty, and family and friends of the students. The Professional Pinning Ceremony marks third-year pharmacy school students in their journey towards a career in pharmacy. Students honored in this event move on to clinical rotation this next year. During the event, students were honored inside the chapel. Some students are also recognized for their outstanding achievements in the school. These special recognitions included: Top Performers in Pharmacy Curriculum Outcomes Assessment, Excellence in Public Health Pharmacy Practice Award, the Cardinal Health Annual Pharmacy Scholarship and the Margaret Self Propst Pharmacy Teacher of the Year. The Cardinal Health Annual Pharmacy Scholarship entails its receiver to full tuition in their final year of pharmacy school. The finalists this year at Samford were Brooke Carter, Mady Shipley and Sadie Nielsen. With a small gasp of surprise in the room, Nielsen received the scholarship and the other two finalists received a $5,000 scholarship for next year. The winner of the Margaret Self Propst Pharmacy Teacher of the Year is nominated by the students. Many students commented that the teacher was “always willing to help on an individual level,” and that it was refreshing to see someone so passionate about what they teach. This award was given to Bruce Waldrop, an associate professor in McWhorter School of Pharmacy. The ceremony also included a speaker, nursing school professor Tonya Sandlin, who gave the students advice as they move on to their clinical rotations, and told her story of her first rotations. Sandlin told the students how important human interaction and serving people is in this field. “There’s not a better service that you can provide than providing service to the people,” Sandlin said. Sandlin concluded his speech by saying how human interaction will always be important, for students to embrace as much as they can and learn as much as they can, and to take pride in what they do. “Technology will never ever replace human interaction. Take time to find your ‘why,’” Sandlin said. After the speech, pharmacy professors presented students with their pins and helped pin them on their white coats. Then, they all gave the Pledge of Professionalism, a pledge by the American Pharmacy Association. There was then a closing benediction by Alex Lott, a class of 2020 pharmacy student, given for the rest of the class as they move on to this next step in their lives. 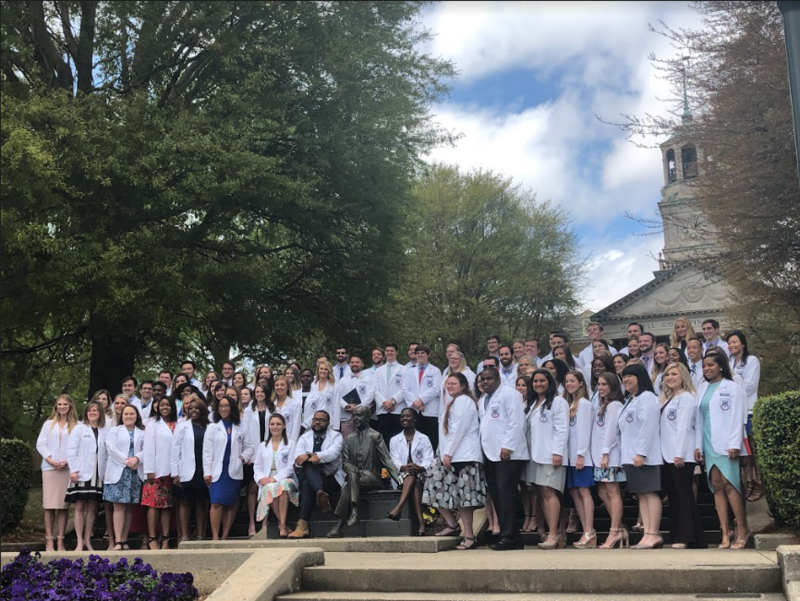 It is a wonderful event that marks a pharmacy student’s life as they move on to the next phase in their career as pharmacists and start their clinical rotations next year.